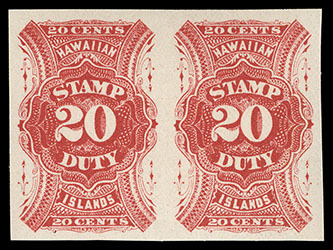 Hawaii, Revenue, 1894, 20¢ red, imperf, horizontal pair, o.g., never hinged, large beautifully balanced margins, rich deep color and exceptional freshness, Extremely Fine and choice, a wonderful gem pair; with 2017 P.S.A.G. 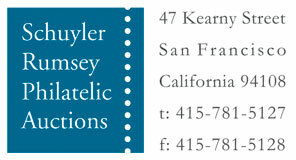 certificate for block. 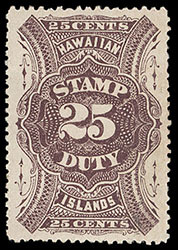 Hawaii, Revenue, 1894, 25¢ violet brown, without gum, exceptionally well centered, bright and fresh, Extremely Fine and choice. 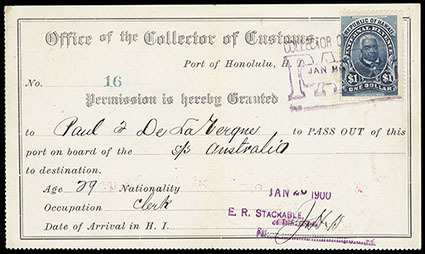 Hawaii, Revenue, 1897, $1 dark blue, tied by purple Collectors of Customs "Jan. 26, 1900, Paid" handstamp on Honolulu port pass for passenger on the Steamship Australia; light fold, Very Fine. Scott No. R11 Estimate $200 - 300. Hawaii, Revenue, 1910, $5 vermilion & violet blue, denomination inverted, neat blue straight line "Cancelled" handstamp, rich color, faint overall aging which does not detract from the overall appearance, Very Fine. ONE OF FOUR KNOWN EXAMPLES OF THE 1910 $5 REVENUE ISSUE WITH DENOMINATION INVERTED. A GREAT HAWAIIAN RARITY. 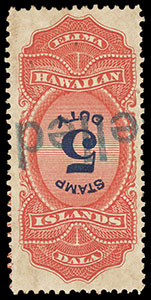 The $5 center inverted revenue issue of Hawaii has only 4 known examples - the Advertiser pair and two singles that where tied on piece. This example was originally tied on piece with other example (which bears a light crease) and was soaked off the piece and split into singles. This is the first time an inverted center single is being offered to the public.